Environmental Graphic Design combines all aspects of design into an experience. 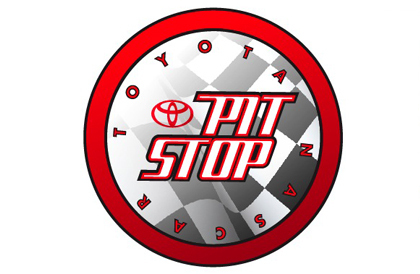 During my five year stint at Studio Productions I helped originate and direct the design and fabrication of many environments. These are some samples from that period and I will continue to share more as I create them through BluePencil ultd. 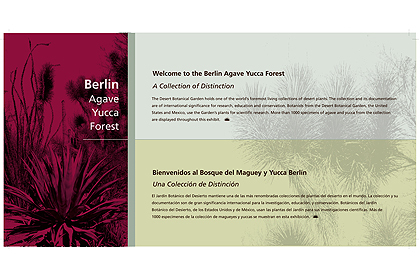 At the Desert Botanical Garden in Phoenix, Arizona you'll see a new exhibit called "The Berlin- Agave Yucca Forest". I was fortuante enough to create the signs that surround the new forest area. The forest boasts some large Joshua trees and other rare desert plants. If you happen to see these characters driving down the road in Tempe Arizona then you are seeing my latest design and illustration project. The city of Tempe along with Nicomia Design and Fabrication partnered with me to create ERIC (The Education/ Recycling Information Center. My task was large but simple, create 2 characters that will promote the initiative. And then, design the interactive stations and information panels that will engage children and adults while they learn about the virtues of reducing, reusing and recycling. 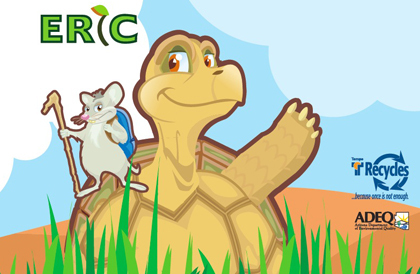 Eric the desert tortoise and Wishbone the pack rat take the kids through an interactive journey thanks to the wizardry of the folks at Nicomia who brought this environment to LIFE!. This traveling museum-style information center will be a centerpiece to Tempe's long celebrated efforts of becoming Arizona's top "Green" city. Look for it at local events in downtown Tempe and be sure to take the kids, they will learn alot and have a blast too! Click here or on the image above to view the interactive displays (hint: zoom in if you have Safari). Installing this week is the new Banner Thunderbird Children's pediatric ward. 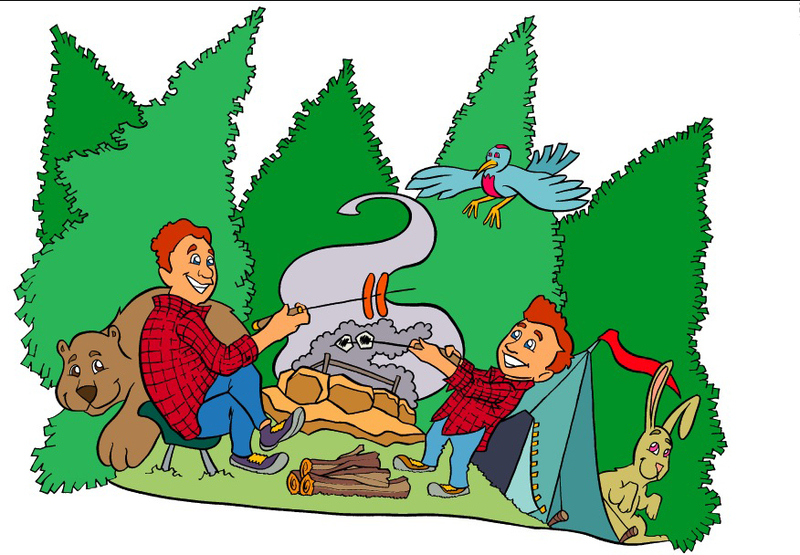 The newly designed children's ER will be using illustrations that I developed. 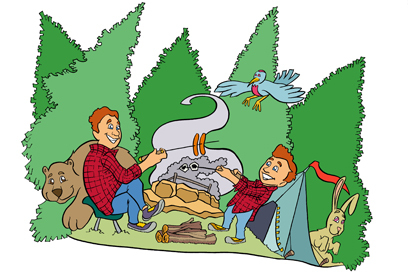 The illustrations help celebrate community service workers and areas of local interest. The area has 11 separate rooms for healing and examination, a greeting area and nurses station. I'll post photos when they become available. It should prove to be a positive enriching environment for the kids and staff. Develop a company mark that will assemble into retail product offerings. Create a wayfinding monument piece at the entrance, design the financial department signage and reclaim the service department as new experience. 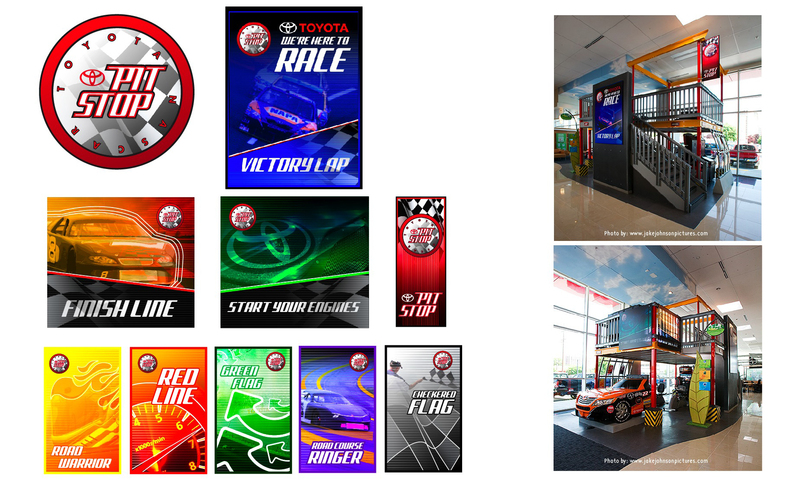 Along with the Engineering Director the goal was to create an original race car themed play environment for kids. A two-story place space was developed. 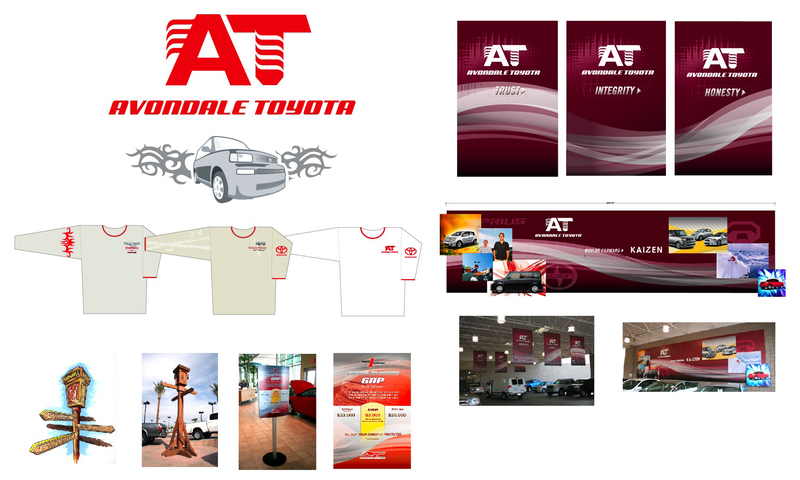 I developed an original brand mark for the space and designed and fabricated the peripheral signage. At the Natick Collection Mall in Boston an entire children's area was developed by ArchitectureKids. 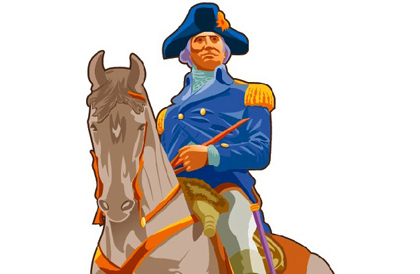 My role was to supplement the space with a half scale relief graphic statue of President George Washington similar to the one at the Freedom Trail. 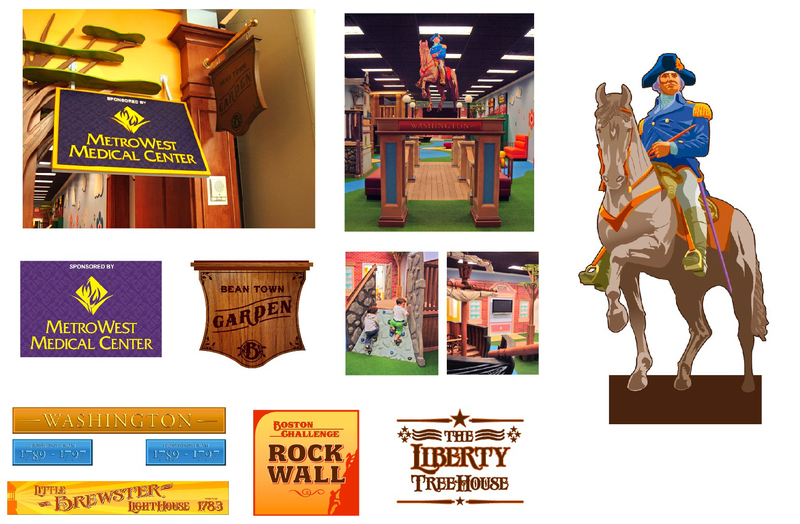 In addition, I designed and fabricated the sposorship signage and the signs for all the play spaces and children's theater. 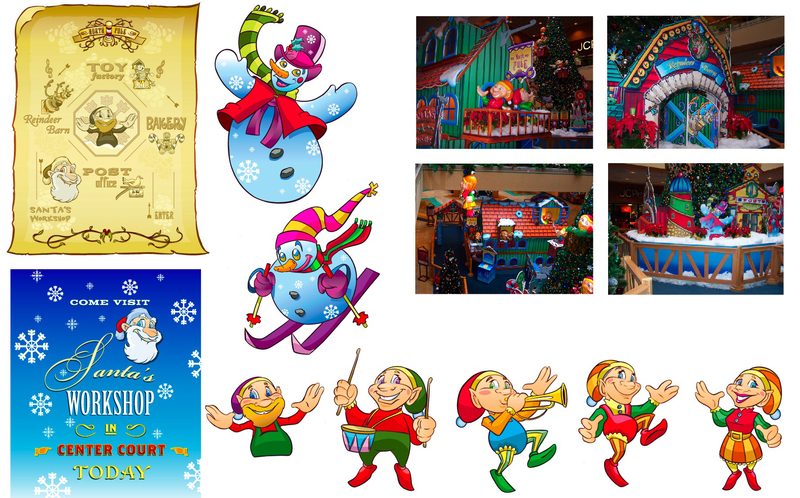 The goal was to create an original Christmas Environment that resembled a storybook winter playland. 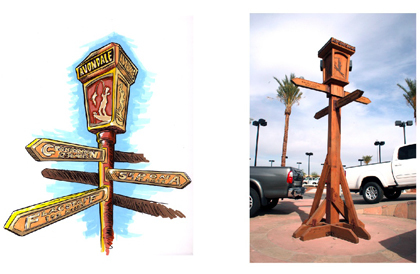 I illustrated the entire environment and it was fabricated and installed. 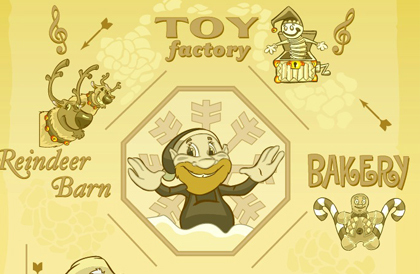 It included sculpted three-dimensional elves also taken from my illustrations. Additional wafinding systems were made to direct the patrons through the mall to the space.